Learn to pray together and see your family transformed!In our world of busy schedules and digital distractions, it's hard for families to find time to eat dinner together, let alone pray together. Yet praying together deepens relationships, alleviates fighting and strengthens family ties more than any single thing you can do. I know for one our family has gotten away from praying together. We get into a good habit or groove, and then the enemy comes and derails us. We maybe each say we pray on our own, but having that time to pray together is really what holds the family up. You will also discover how a family that prays together becomes an unstoppable force for good, bringing God's answers to impossible situations. And it can start with you! Through prayer, you have the power not only to change the atmosphere of your home but also to be part of changing the spiritual atmosphere wherever you go. 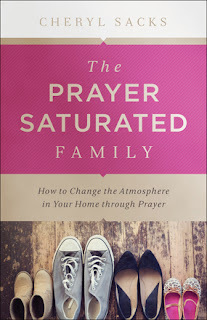 Includes a Step-by-Step 31-Day Family Prayer Guide!Full of the creative ideas, prompts and Scripture-based prayers you need to help jump-start and develop your family's prayer life. This book was very inspirational to me to get back on track with collective prayer as a family. We will be doing the 31 day family prayer challenge at the back of the book to kick off 2017. I am excited to see what God has in store for us as we dedicate back to Him our prayers and praises in the new year.